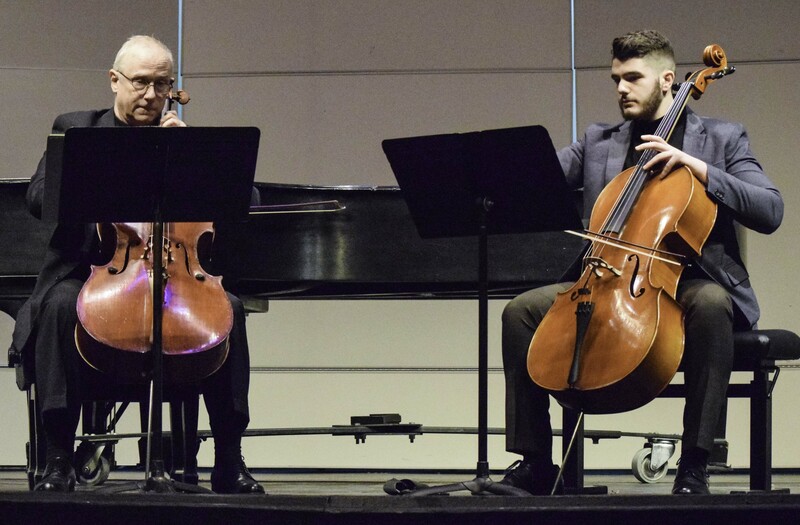 Anna Meassick | Professor Theodore Mook (left) and Sophomore Faares Deeb (right) perform a duet on the cello for the third performance of the music convocation. The University of Rhode Island’s music department held its second music convocation of the spring semester on Thursday, Jan. 31 at 12:30 p.m. in the Fine Arts Concert Hall. Concert hall doors opened shortly before the 12:30 p.m. with programs available at the door. 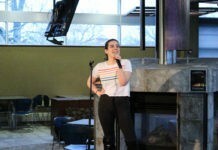 The event was free of charge and featured performances from students and faculty members. This convocation featured a theme with the chosen pieces of music. The selected pieces were either Latin American compositions or were influenced by Latin American music and musical styles. Three of the composers that had pieces featured were born in Latin American countries, one was of Latin American decent and another was heavily influenced by Brazilian music. The first performance featured two pieces from composer Alice Gomez’s “Peruvian Dance Suite.” The two pieces, “Tususacuy” and “Bailecito,” were performed by a quartet of students. Molly Vallee and Sarah O’Brien played the flute, Joseph Smith played the cajon and Remy Besson played the marimba. This performance brought together a unique pairing of woodwind and percussion instruments that created a folk-infused sound blended with Peruvian melodies, rhythms and harmonies. The following performance featured Susan Thomas, senior lecturer and flute teacher, alongside fellow department member and collaborative pianist Gayane Darakyan. They performed “Seis Flautero,” written by Venezuelan composer Miguel Astor. It was a fast-paced performance that displayed a high pitched, fluttering tone from Thomas’ flute playing. Darakyan’s piano playing kept with Thomas’ fast pace flute and high pitched sound. As the halfway point of the piece approached a noticeable change in the tone of the piano emerged. At this point Darakyan’s playing was not as high pitched as in the beginning, but instead had more of a deeper tone to it. The afternoon’s third performance featured Mook and Sophomore Faares Deeb playing two Brazilian duets on the cello. They performed the pieces “Carinhosa,” by Brazilian composer Pixinguiha and “Brasileirinho,” by Brazilian conductor Waldir Azevedo. Both pieces were classified under the Brazilian popular music genre known as Choro. This genre is noted for its fast and happy rhythm. Pixinguiha and Azevedo are considered to be two of the all-time greats of this genre. The first piece, “Carinhosa,” was mellow and slow-moving and had a dark and gloomy tone to it. The second piece was more upbeat than the first. The music was played with a much faster rhythm and seemed to move along quicker than the first. According to Deeb, both pieces were chosen by Mook. The concluding performance saw Darakyan return to the stage, this time alongside fellow pianist and URI music Professor Manabu Takasawa for two pieces. The first, was a melody from Christoph Willibald Gluck’s “Orfeo ed Euridice” opera. This was the only performance that featured two pianos on stage simultaneously. This piece was slow paced and gloomy. It had a dark tone to it. The final piece was the third movement of Darius Milhaud’s composition “Scaramouch,” titled “Brazileira.” This piece differed from the prior one as it was faster. Both Darakyan and Takasawa moved their fingers across the keys at a much quicker rate making for a more upbeat tempo to the final piece of the afternoon. 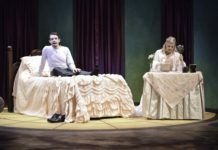 Upon the completion of the final piece, all of the performers returned to the stage for a round of applause and final bow followed by a question and answer segment with the audience. One student in attendance asked Mook if it was intentional that the pieces chosen were Latin American or Latin American inspired. “Yes, we intended on that being the theme of the performances,” Mook said. Another question that stood out was if it is common for flutes and percussion to play together in reference to the first performance of the afternoon. The students of that performance responded with the similar answer of for those pieces the percussion instruments fit well around the sound of the flutes. The majority of questions asked revolved around the choice to have a Latin American theme to the concert. Upon completion of the question and answer segment the performers exited the stage to a final round of applause.